Hall Sectional Sofa Recliner Left Facing. Create your own custom sectional furniture. Choose any style and configuration, large or small. Thousands of fabrics. Cushion options. Customize it! Free shipping. Quality construction. Back Cushions: Semi-attached loose back. Poly back cushions or upgrade your cushions. 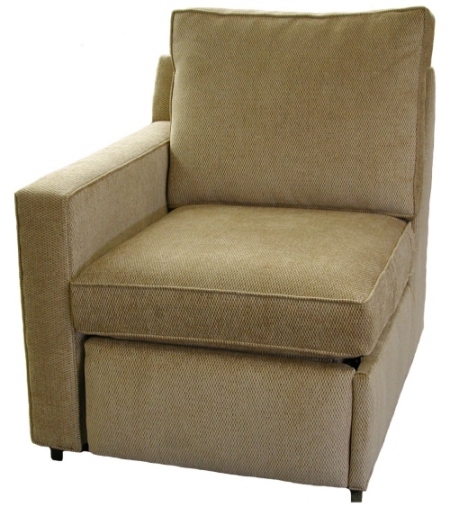 The recliner’s activation handle is located between the seat cushion and the inside arm. To “unlock” the foot-rest, pull back on the thin handle and the foot-rest of the recliner will be released. When the foot-rest has been released, let it extend as far up as it will go. You might need to lift your legs slightly if you’re not sure it is fully extended. 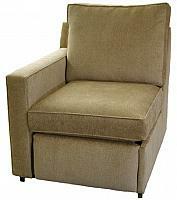 Once the foot-rest has been extended, you use your body to “slide” the back and seat into the full reclining position. The motion you’ll use to “slide” into full reclining position is to push down and towards the front of the chair with your hips and, if need be, push back on the arm. This will gently “slide” you into position. To move the recliner back to an up-right position, just sit up (which will move the recliner back to the TV position with just the foot-rest extended) and then move the foot-rest down with your heels/legs until you hear a click when it is “locked” back in place. Just repeat these steps when you are ready to recline again.